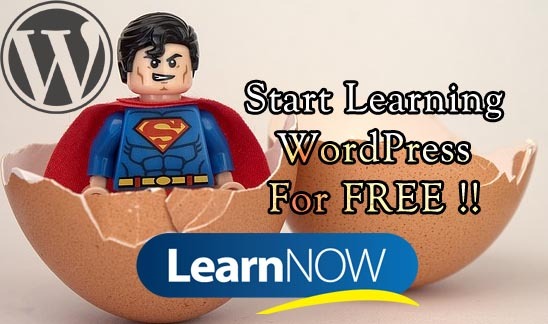 If you are installing a Free theme from WordPress repository, almost all theme has a small message appearing in the footer that links to WordPress.org saying “Proudly Powered by WordPress“. You can find almost in every free theme including Twenty Seventeen, Twenty Sixteen, etc. They do deserve a little credit since they have spent hours developing such beautiful themes just for you. And for FREE!! However, most of the time, these messages are annoying. If you are developing a website for your client, it doesn’t look professional. No matter how beautiful the design is, the footer credit message seems quite irritating. Instead of that, you may want to show your company logo that links to your website or simply leave it blank on the very bottom of the page. In this post, we are going to learn multiple ways to remove the footer message from default themes or even premium ones. Is it Necessary to Remove the WordPress Footer Credit Link? WordPress is completely free and licensed under the GPL. That means you can modify, change, re-use, or even distribute without any permission. As long as you don’t feel it’s wrong to remove the footer link, you have complete authority to remove it. Furthermore, any Theme you download from the official WordPress repository also covers under the same license GPL. Therefore you are free to edit/modify them too. So How Do I Hide the WordPress Footer Message? As mentioned earlier, there are multiple ways in which you can hide/remove the WordPress footer credit links. However, in this tutorial, we will discuss two recommended methods. This one is the easiest and simplest method to remove the footer credit. Just adding some CSS code will do that. Go to Appearance > Customize from the WordPress Dashboard. 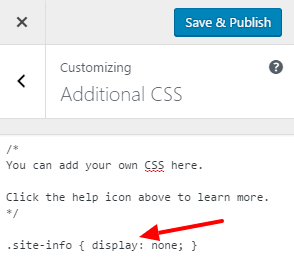 Click Additional CSS at the bottom of the menu, and Paste the below CSS code inside the box. After that hit on Save Button. Now refresh your website you’ll see the footer credit link will disappear. Child Theme is highly recommended for this method. Firstly, create the child theme, activate it, and copy the parent theme’s footer.php file to your theme. Now, open the footer.php file and search for below code. Remove the above code. Now, the footer credit link will be gone. If you aren’t familiar with identifying the template, there is an alternative for this too. From your WordPress Dashboard, Go to Appearance > Editor. Look for the code and delete the following lines of code (Again we are editing default Twenty Seventeen Theme Here). Now click the Update button. 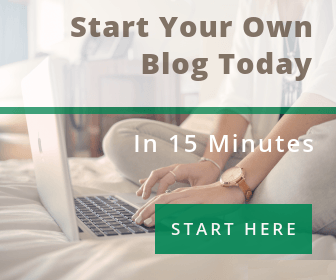 You will not see Footer WordPress Credit link appearing on your website. If you remove the above code, the footer credit will also be removed. The above code is extracted from Twenty Sixteen Theme. Even if your parent theme gets updated, the changes you made will not be lost. If you customize the code in the parent theme’s templates, the next time when it gets updated, all the changes will be lost. In fact, after the theme’s update, all the codes will be reverted back to the way it was before. It’s like installing a new theme again but this time it would be updated one. There’s no risk that you will change the wrong code. Even if you mistakenly crash the website, you can always regress your site to default. It is easy to extend and use. This is how you customize/remove the footer WordPress credit link. If this helped you in any way please subscribe to our site. If you have any question feel free to ask in the form below. Next story WordPress Admin Bar Explained ! !